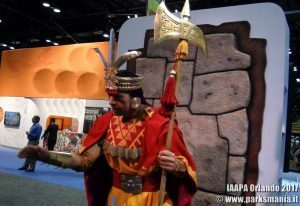 Numerous novelties from different companies at IAAPA Attractions Expo 2017 in Orlando (Florida). New rollercoasters, new attractions that implement virtual reality, new types of fun and new dark rides. And animatronics... This year is the turn of "Wiracocha", the warrior named like one of the greatest divinities of the Inca people. Parksmania.it produced a short video directly from the Sally Corp. stand.